The following table shows the folks who are trying to establish a new record for the number of species of birds seen in Alameda County during one year. If you'd like to be listed, along with your year's totals for the county, contact Bob Power. Here are some of the unusual species seen in Alameda county so far this year: Tufted Duck, Ashy Storm-Petrel, Least Bittern, Yellow Rail, Sharp-tailed Sandpiper, Parasitic Jaeger, Franklin's Gull, Rhinoceros Auklet, Pileated Woodpecker, Scissor-tailed Flycatcher, Mountain Bluebird, Gray Catbird, Sage Thrasher, Virginia's Warbler, Black & White Warbler and Nelson's Sharp-tailed Sparrow! 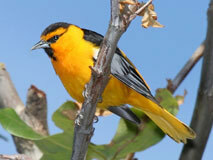 Want to see a list of birds seen in the county in 2008? Click the button! If you see an unusual bird, no fair keeping it a secret. Post your sightings on EBB, or it won't count. If you're not an EBB member, learn how by clicking the button! Wingbeats is an educatonal project of Bob Lewis, Berkeley, California.